Regular practice is the best way to reinforce concepts and allow students to gain confidence and mastery of skills. 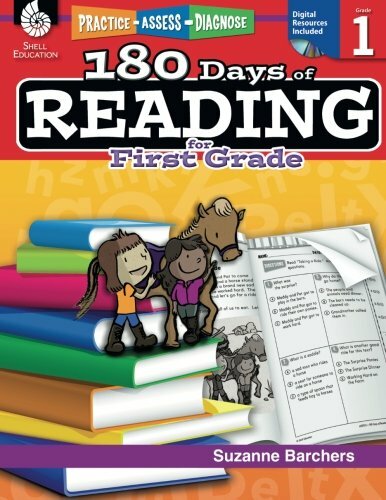 With 180 Days of Reading for First Grade you get reading and critical thinking exercises for students for every day of the school year. Presented in a consistent format from week to week, the activities in 180 Days of Reading allows students to progress in reading comprehension and word study skills, and makes diagnostics and assessment easy for parents and educators. Through both fiction and nonfiction reading passages, students get purposeful practice in engaging with diverse texts appropriate for their grade level. Ideal for after school study, intervention, or homework, 180 Days of Reading workbook activities are correlated to College and Career Readiness and other state standards. In addition to reading passages, data-driven assessment tips as well as digital versions of the assessment analysis tools are provided. With text passages that advance in complexity throughout the year, student learning is enriched by developing and honing skills of reading comprehension, interpretation of symbols, making logical inference, summarizing and responding to literature, and more. Boost your First graders reading skills in a hurry with the easy-to-use activities in 180 Days of Reading!